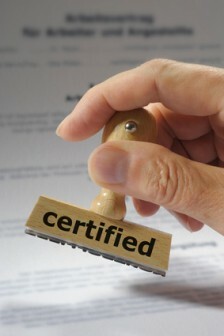 Who is entitled to certify translations? Only certified translators are authorised to certify the correctness and completeness of their own translations by applying an official stamp. I was certified by the Regional Court of Hanover back in February 2012, i.e. I am officially authorised to certify my own translations. Officially-stamped documents, such as deeds, school certificates and diplomas, court decisions, certificates of no impediment, driving licenses, criminal records, last wills and testaments etc., are often required by the authorities, schools, courts and other official institutions. Do foreign governments accept certified translations from Germany? Foreign governments generally accept certified translations from Germany. However, from time to time an overseas governmental institution may require authentication of the translator’s signature (called an “apostille”). This is then issued by the responsible authority. I can provide you with an apostille from the Regional Court in Hanover, should you require one. Please feel free to contact me! Click here to access my contact form.